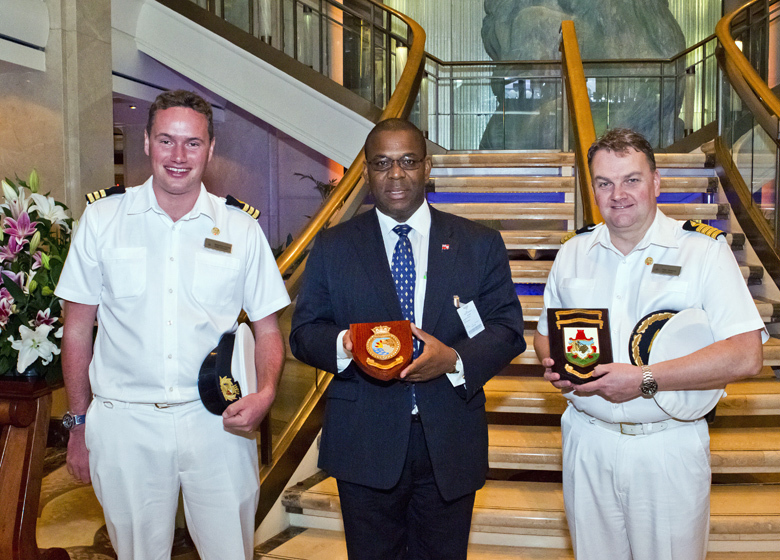 A Bermuda delegation participated in a welcome and plaque exchange aboard the MS Aurora, during the ship’s short stay at King’s Wharf, Royal Naval Dockyard this week. Deputy Premier and Minister of Transport & Regulatory Affairs, Walter Roban led the delegation aboard the Bermuda-registered luxury liner which arrived from the port of Charleston, USA on its inaugural visit to the island. Stopping in its home port for the day and then sailing onto Ponta Delgada, Azores, the vessel carried some 1900 passengers and a crew of 850. The Deputy Premier welcomed Deputy Captain Alan Hawkins and crew of the sixth largest of eight ships currently in service with P&O Cruises. He said, “Visitors have been cruising to Bermuda for more than a century and, today, we welcome more than ever before in three port of calls. “It is as a result of great organisations such as yours – and modern marvels like the MS Aurora – that travelers are finding ocean cruising more comfortable and rewarding. I congratulate you and your crew for your participation in the growth of the cruise industry. At over 76,000 tonnes, Aurora was built by Meyer Werft at their shipyard in Papenburg, Germany. Those present for the ceremony and tour of the ship included officials from the Ministry of Transport, Marine and Ports Services, Bermuda Tourism Authority, Host Port the West End Development Corporation, ship’s agent Meyer Agencies and the Bermuda Shipping and Maritime Authority. Thanks to the OBA Trolls on the bloggs and the X Ministers that tried to give every Tom and Dic Bermuda Status! If that was so priceless why did the UBP have to change the name to OBA? PRICELESS for another failed Team UBP. Now go find another Craig to lead the 12 seat party out of the Milk Barn Experiment. It may be priceless to you…but it’s worrisome to me that twice as many voters are clueless. It’s priceless that the plp has only won twice in over 400 years. Yes during the 400 years blacks were slaves. A very sad time it was. People you help the OBA win when you blog comments like that. NOT!!!!!! Are you really stupid enough to believe that the PLP attracted this cruise ship in the 2 months since they have been in power. lol absolutely nothing to do with the plp, thank you OBA and the BTA! Thanks to the America’s Cup events which put our little island in the lime light and the TV coverage has put us back on the international map. With the dreadful damage done to the island destinations to our South, we can possible be a destination for many of the cruise liners until these islands are up and running once more. For each tourist that steps on Bermuda soil, a donation can be sent to these islands to help them recover. Each ship decides which island they would like to help and as each passenger disembarks here, $1 or more is put in a collection container either by the passenger or by the ship itself. Would this be possible? If there’s a will, there should be a way! All due to the OBA and BTA! Thanks!